The Eiffel Tower, built for a World's Fair in 1889, has become a permanent symbol of the city of Paris, France. Engineering the Eiffel Tower introduces readers to its designer, Gustave Eiffel, shows how workers assembled the gigantic tower, and looks at how maintenance crews keep it standing today. Abdo has a BookLinks page for this title that has links to some related web sites. 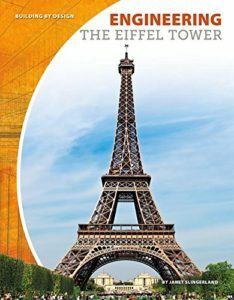 Perhaps the best information about the Eiffel Tower is on the official website, including this biography of Gustave Eiffel. There is also a biography of Eiffel on the Statue of Liberty National Monument web site that focuses on his work on the Statue of Liberty. The Verge has an interesting photo essay about the installation of wind turbines on the Eiffel Tower. If you would like to draw the Eiffel Tower, check out this post at Art Projects for Kids. Here is a printable paper model of the Eiffel Tower that you cut out and assemble. Math lovers might like this math problem (designed for 5th graders) involving the Eiffel Tower, from Illustrative Mathematics. Building Examples has instructions for building the Eiffel Tower out of Lego or Duplo bricks. Teach Engineering has a one-hour lesson plan where 4th graders are challenged to build a tower out of recycled materials in Recycled Towers. [T]here’s an attraction in things colossal, a special charm to which theories of ordinary art are hardly applicable.